One of the easiest ways for credit card companies to grab your attention is with a big bonus. Some offer that bonus in the form of miles or points, others in the form of cash back. Below you will find the credit cards that offer big bonuses in both point and cash form. Pay close attention to the details of each card, because in order to earn the bonus, you must meet a spend requirement. 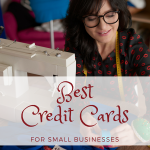 These high bonus credit cards also offer a lot of other perks and rewards that make them attractive beyond the first year. Citi Prestige® Card – For a limited time only, new Citi Prestige® Card will earn 750,000 bonus points after spending $7,500 in the first three months. That’s a lot of cash to be spending in three months so make sure you’ve got purchases lined up to take advantage. Another big benefit of this card is that every year to stay a member, you’ll earn a $250 credit on air travel. This means when you purchase a ticket using this card, the first $250 is refunded back to you in the form of a statement credit. When you book travel through ThankYou.com, your points are worth 25% more. So 75,000 bonus points can actually be worth $937.50 in travel benefits. Cardholders of the Citi Prestige® Card also gain access to the VIP airport lounges through Priority Pass Select. Yet another benefit is that every five years, you can receive a $100 statement credit for reimbursement into Global Entry or TSA Pre-Check. Of course, the cost for all of these crazy good benefits is a $450 annual fee. 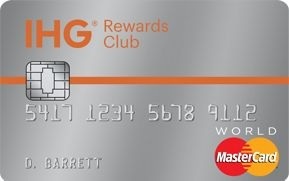 IHG® Rewards Club Select Credit Card – I just signed up for this offer myself, so I can attest to it’s quality. The IHG® Rewards Club Select Credit Card starts with a cool 80,000 bonus points after you spend $1,000 in three months. A nice, low spend hurdle to reach, so routine everyday purchases should get you there. Those 80,000 points can be redeemed toward any IHG hotel (think Kimpton, Holiday Inn (Express), Crown Plaza). Five points per dollar are earned at IHG hotels, 2 points per dollar at gas stations, grocery stores and restaurants and one point per dollar everywhere else. Every anniversary, you’ll receive a free night’s stay. When I signed up for the IHG® Rewards Club Select Credit Card, my reward status immediately went to Platinum, which lined me up for even more benefits (including earning points faster). The annual fee of $45 is waived for all first year cardholders. 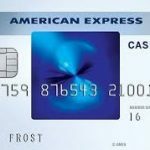 Blue Cash Preferred® Card from American Express – The smallest bonus on our list, the Blue Cash Preferred® Card from American Express gives a $150 statement credit after spending $1,000 in the first three months of account ownership. The big money this card can save you comes with a fantastic rewards program. 6% cash back on groceries (up to $6,000 spent annually), 3% cash back at the pump and at select department stores, and 1% cash back on everything else. For a limited time, the $95 annual fee is WAIVED for all first year cardholders. Cash back is received in the form of Reward Dollars that can be easily redeemed for statement credits, gift cards, and merchandise. Rewards never expire so long as your account remains open and in good standing. Added perks of the Blue Cash Preferred® Card from American Express include free ShopRunner membership, extended warranties and damage protection for new eligible purchases. Chase Sapphire Preferred® Card – If you have $4,000 to spend in the first three months, the Chase Sapphire Preferred® Card has 50,000 bonus points available for you. Those 50,000 points are worth $500 in cash, or $625 in airfare because points are worth 25% more when you redeem them through Ultimate Rewards. Added bonus; when you add an authorized user and they make a purchase within the first three months, you’ll get another 5,000 bonus points. 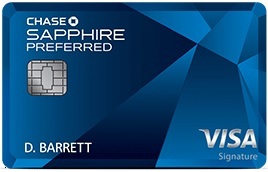 There are no blackout dates or travel restrictions when redeeming rewards with the Chase Sapphire Preferred® Card. The rewards program is easy to follow: Double points on travel and dining, single points on every other purchase. 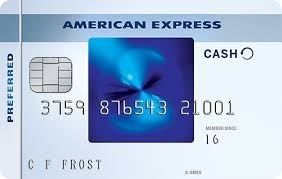 There is a $95 annual fee associated with this card, but it’s waived for all first year cardholders. Starwood Preferred Guest® Credit Card from American Express – New cardholders of the Starwood Preferred Guest® Credit Card from American Express will earn 25,000 bonus Starpoints after making $3,000 in purchases during the first three months. Depending on your savvy, Starpoints can be redeemed for more than the standard 1 penny = 1 point breakdown. There is a $95 annual feel, but it’s waived for all first year cardholders. 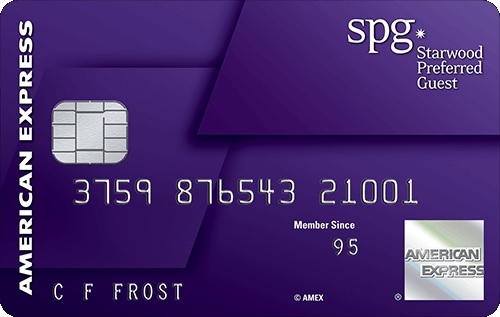 The Starwood Preferred Guest® Credit Card from American Express is a great AMEX rewards card. Earn one point for each dollar spent and up tp 5x Starpoints for spending at hotels and resorts participating in Starwood Preferred Guest Program. Redeem Starpoints for free nights at over 1, 000 hotels and resorts in nearly 100 countries and for flights on more than 350 airlines, all with no blackout dates.